Saudi Arabia has a unique architectural heritage that has developed over the centuries. Historically, building designs and materials in Saudi Arabia were dictated by the climate, geography and resources available. For example, builders in the central areas preferred adobe for its malleability, availability and insulating qualities. In western Saudi Arabia, stone and red brick were common, while Jeddah’s builders used coral from the Red Sea. Contemporary Saudi architects are increasingly looking to these traditional building designs and Islamic concepts for inspiration. This combination of tradition with the ultra modern strengthens the link between a cherished past and an innovative future. 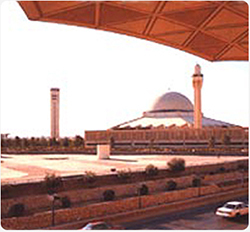 King Saud University and the King Khalid International Airport are two striking examples of just how well traditional Islamic design and modern structure can be combined. Minarets are the most visible man-made structures in Saudi Arabia. They jut from the skyline of every Saudi urban center, from the smallest village to the largest city, a testament to a Muslim society’s bond with God. The reason minarets rise above all surrounding structures is to allow the call to prayer to be heard by inhabitants of all homes in a mosque’s neighborhood. Traditionally, muezzins used to climb up the stairs to the top of the minaret and call the faithful to prayer five times a day. The melodic call of the muezzins could be heard rising from minarets across all Muslim cities. Nowadays, most minarets are wired for sound and the muezzin is no longer required to make the demanding walk up the minaret. Every mosque has at least one minaret, although two are more common, and larger ones have more, with the Holy Mosque in Makkah boasting 12 magnificent ones. They range in size from some 20 feet in small village mosques to 360 feet in the Prophet’s Mosque in Madinah. Some are simple, while others are elaborately decorated with stone and tiles.